Laura was at her wits’ end with her cat Coco, a 6-year-old Siamese mix. Ever since Laura’s work schedule had picked up last fall, Coco had begun urinating on her bed. It would happen a few times a week. Laura had thoroughly laundered all the bedding and applied a pet odor remover. When this didn’t help, she put down plastic sheeting atop the bed, added a second litter pan nearby, and kept it impeccably clean. All to no avail. Coco had always been a very friendly cat, but now she was sticking to Laura like glue. Meowing, rubbing against her legs, waking her in the early morning, and constantly getting underfoot. It was impossible for Laura to get anything done without Coco kneading, pawing, or depositing herself right in the middle of whatever she was doing. Coco had a classic case of feline separation anxiety syndrome (SAS). What Is Separation Anxiety in Cats? Separation anxiety is a well-recognized behavior syndrome in dogs, but many people don’t realize that cats can experience it, too. Conventional wisdom says that cats are too independent and apathetic to fret over a person’s comings and goings. Not so. In fact, cats are highly social creatures with the ability to form deep attachments to humans and other animals. For some felines, this attachment becomes excessive and dysfunctional. When a treasured human is absent, these kitties can suffer true distress, and that comes often out as inappropriate behavior. Feline separation anxiety usually presents more subtly than it does in dogs and therefore may go undiagnosed or misdiagnosed for years. The typical dog with SAS will bark, whine, pace, howl, and become overtly destructive in the home. It’s hard to miss. While cats with SAS may be more demanding and needy, they’re equally apt to internalize their stress by becoming withdrawn, not eating, and literally pulling their hair out. The signs of SAS in cats can overlap with a wide range of health and behavior problems such as urinary tract disease, inflammatory bowel disease, and other causes of inappropriate urination. 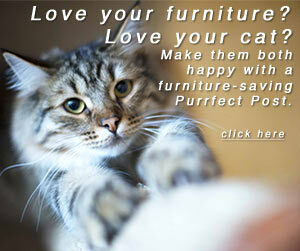 Therefore, is essential to consult with your veterinarian if your cat shows these signs. He or she will perform a full exam along with appropriate lab tests to rule out physical problems. A precise behavioral history is also essential to determine exactly what’s going in. Signs of separation anxiety in cats may include those below. House-soiling is probably the most common manifestation of separation anxiety in cats. The target may be the owner's bed or belongings, as in Coco's case. Unfortunately, house-soiling is also associated with a host of other feline medical and behavioral problems, from urinary tract infection to diabetes to inter-cat aggression. This lack of specificity can make diagnosis difficult. Excessive clinginess can be a sign of SAS. In fact, cats that are needy, dependent, or hyper-attached to their owner are at most at risk for developing SAS. A cat that clings like glue whenever you're preparing to leave home or greets you each evening like a long-lost friend is a prime candidate for the disorder. Social withdrawal can be a confusing sign of separation anxiety in cats. These cats may hide and seem more stand-offish around an owner’s comings and goings. Humans tend to call it anger or spite when their cat turns a cold shoulder to them in this manner. In fact, this is just our human interpretation of what may be a stressed-out kitty. Overgrooming may occur in cats suffering from SAS. Like humans who bite their fingernails, cats that feel stressed out may take it out on their fur, leaving their forelegs, lower back, abdomen, or thighs threadbare or bald. Food or environmental allergies can present in the exact same way, creating a diagnostic challenge for your vet. Appetite loss, vomiting, and diarrhea that occur around your absences are classic signs of feline stress, but they are equally common indicators of physical illness, so be sure to consult with your veterinarian if you see these signs. Destructive behavior is a classic sign of SAS in dogs but it's less common in cats. Still, things knocked off windowsills or scratch marks on your front door may be a clue. Likewise, cats rarely vocalize the way dogs do when suffering from separation anxiety, but if they do, it's a sure sign. It’s worthwhile to note that SAS may be more common in certain feline breeds, those with more humanlike temperaments such as Siamese and Burmese. Inadequate early socialization (such as in orphaned, feral, or shelter kittens) may also yield dysfunctional social attachments in adulthood. Beware of behavior changes in your cat following a family vacation, a change in work schedule (as in Coco’s case), the arrival of a new baby, or the death of another pet because this can be a red flag for SAS. As with dogs, treatment for SAS kitties relies on behavior modification, environmental enrichment, and often, medication. Eliminate triggers. It may be helpful to desensitize your cat to the cues that show you’re about to depart. If your cat starts acting needy (or by contrast, retreats under the bed) as soon as you make the coffee, put on your shoes, or pick up your keys, try performing these things in a different order or at random times of the day when you’re not about to leave. The goal is to render these clues meaningless as a trigger for your cat’s stress. Consider ignoring your cat for the 15 minutes before you leave and ignore her again when you first get home, hard as it may seem. Make your comings and goings as unexciting as possible. This creates less anxiety around your absence. Avoid reinforcing “needy” behavior. Refrain from rewarding your cat with your attention or with food when she relentlessly meows, paws, kneads, sits on your computer keyboard or nibbles on your nose at 4 am. Your reaction to these overtures may actually reinforce the unwanted behavior. Ignore, walk away, toss a toy, or otherwise redirect your cat’s attention if possible when this behavior begins. Enrich the environment. Make your cat’s surroundings as interesting as possible. Engaging his feline curiosity may take the sting out of your absence. Provide intriguing toys, a good climbing structure, a fish tank, or a perch by a window with a bird feeder outside. 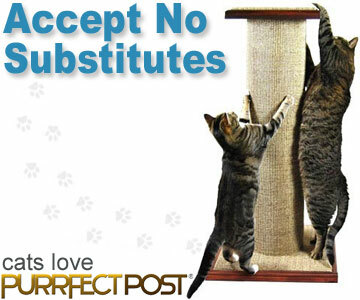 Provide scratching posts and condos for scratching and perching. Work routine grooming sessions and play times into the hours when you are home. This may help your cat learn to tolerate your absences better. Consider using feline facial pheromone spray to help calm your cat. Treat inappropriate elimination. If your anxious cat is using your bedroom as her bathroom, it’s time to take the usual steps against inappropriate elimination. Start by thoroughly laundering the stain from clothing or bedding. Use a pet-safe stain and odor remover on mattresses, upholstery, and floors. Switch to unscented clumping cat litter, and keep litter pans fastidiously clean. Adding another litter pan near the target site is also recommended. Again, note there are multiple potential causes of inappropriate elimination, so be sure to discuss this with your veterinarian. Don’t get another pet until the situation is sorted out. It’s your company your cat craves, not another cat’s. In fact, another pet competing for your love and attention can make matters worse. Medication. Finally, anti-anxiety medications such as Prozac®, Elavil®, and Clomicalm® can be very effective in treating separation anxiety in cats. These and all medications must be used only as prescribed for your cat by your veterinarian or veterinary behaviorist.